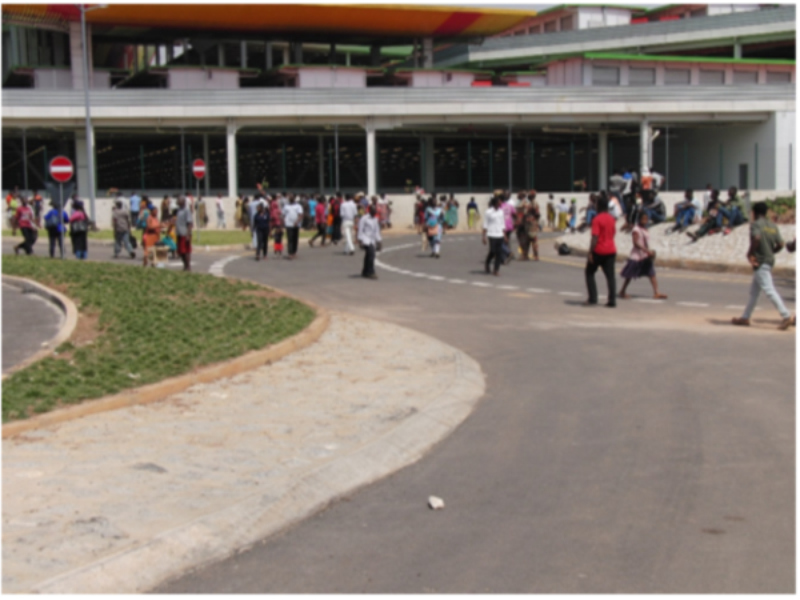 The Kumasi Metropolitan Assembly (KMA) has openedarterial roads linking the completed first phase of the Kejetia/Central MarketRedevelopment Project in Kumasi. They include KomfoAnokye Teaching Hospital (KATH) toPampaso, Kejetia to Dr. Mensah, Kejetia to Suame Roundabout and Central Marketsroads. The development is expected to bring significantimprovement in the traffic situation in the Central Business District (CBD) of Ghana’ssecond largest city. The roads were closed to traffic last two years forthe contractors, MessrsContracta Engineering Limited, to work on the roadnetwork improvement around the project which is a key component of the project. Most traders, taking advantage of the on-going works,besieged pavements and other unauthorized areas at the CBD for business, andthis came with its own repercussions as the precincts of Kejetia most at timesbecame congested. 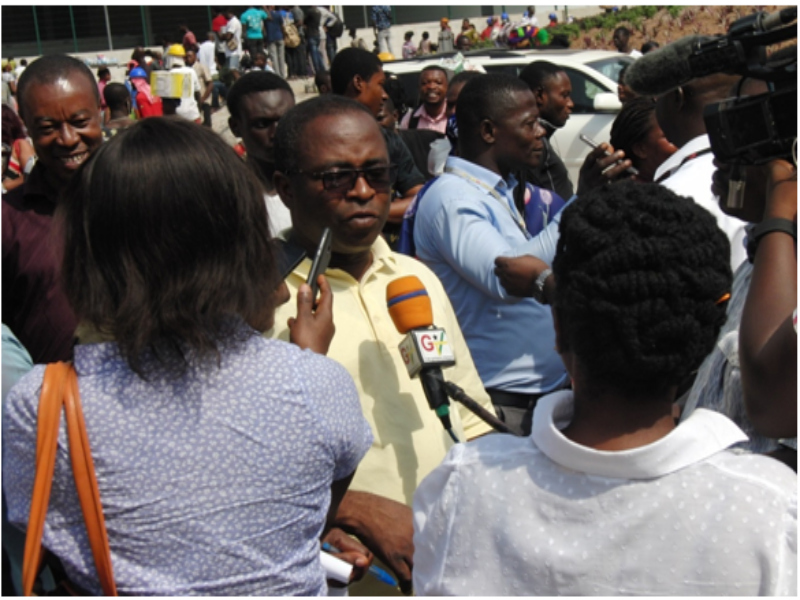 Mr. Godwin Okumah Nyame, the Public Relations Officer (PRO) of KMA, in an interview with the media in Kumasi. Mr. Godwin Okumah Nyame, the Public Relations Officer(PRO) of KMA, in an interview with the media in Kumasi, reminded the tradersthat the roads were purposely opened to traffic, but not for traders orhawkers. All the affected traders, he said, ought to relocateto any of the 34 satellite markets dotted around the city, citing Patase,Adumanu, Afia Kobi, Race Course, Atonsu, amongst others. Significantly, the project had added to the scenicbeauty of the ‘Garden City of West Africa’, and the authorities had sincedeployed a task force to maintain law and order as they work to keeprecalcitrant traders from returning to the pavements. For now, security personnel made up of soldiers,police, immigration, fire and the prisons had been placed at vantage pointswithin the CBD to ensure discipline. 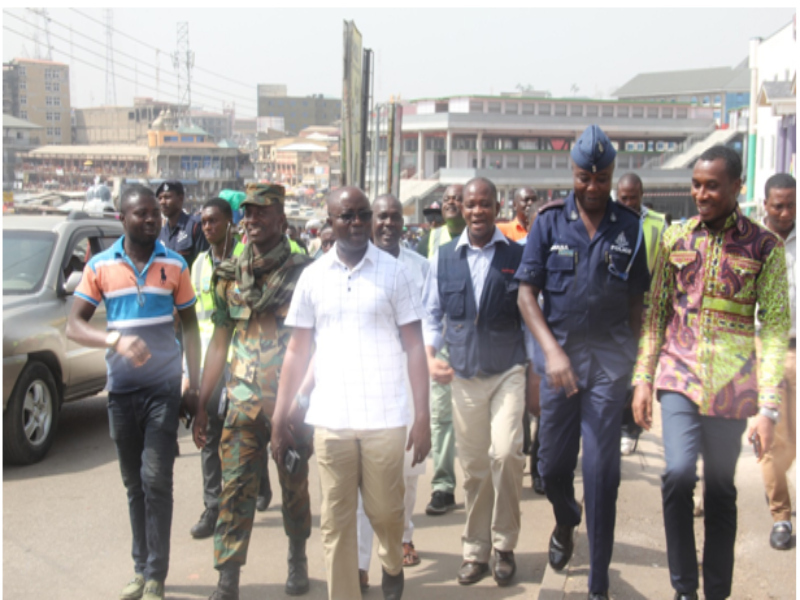 Mr. Osei Assibey Antwi, the Metropolitan ChiefExecutive (MCE), on his tour of the arterial roads a day after they were openedto traffic, reiterated the need for the traders to be law-abiding. “We want to make sure that there are no obstacles onthe roads to enhance the free-flow of traffic,” he noted, stressing that underno circumstance would the Assembly allow any trader to hawk on the roads. The MCE was emphaticthat the Assembly’s task force would continue to be at post until all thetraders were relocated to the designated satellite markets. Mayor Osei Assibey Antwi, the Metropolitan Chief Executive (MCE), on his tour of the arterial roads a day after they were opened to traffic. What is: 2 + 15 ?